What are the market’s tendencies around ‘Fed Days’? 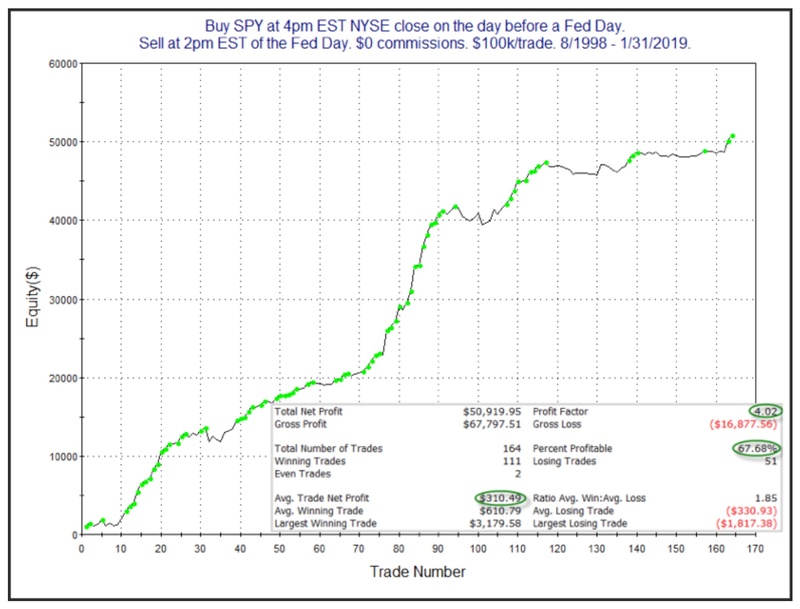 Buy SPY (the ETF that tracks the S&P 500) at the close on the day before the Fed announcement and sell at 2 p.m. EST on the day of the announcement (just prior to the typical announcement time). 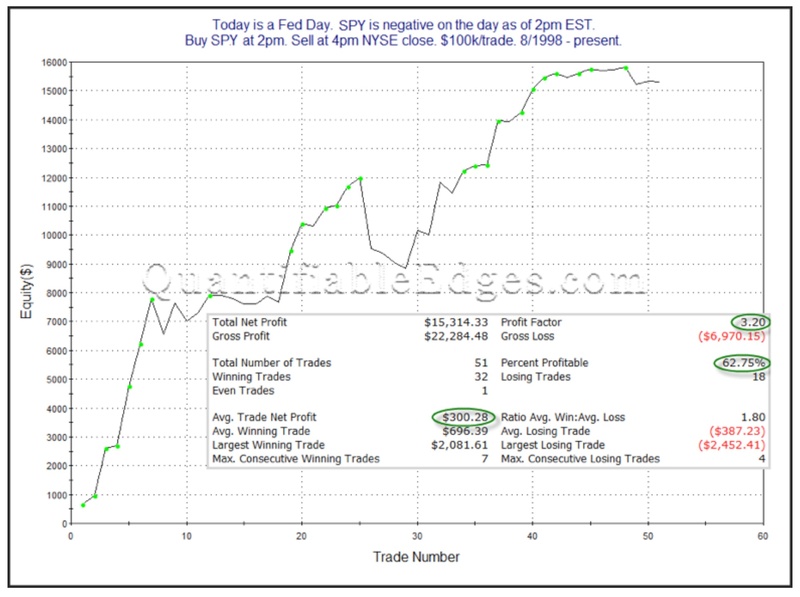 Buy SPY at 2 p.m. EST on a Fed Day and sell at 4 p.m. EST, when the market closes. 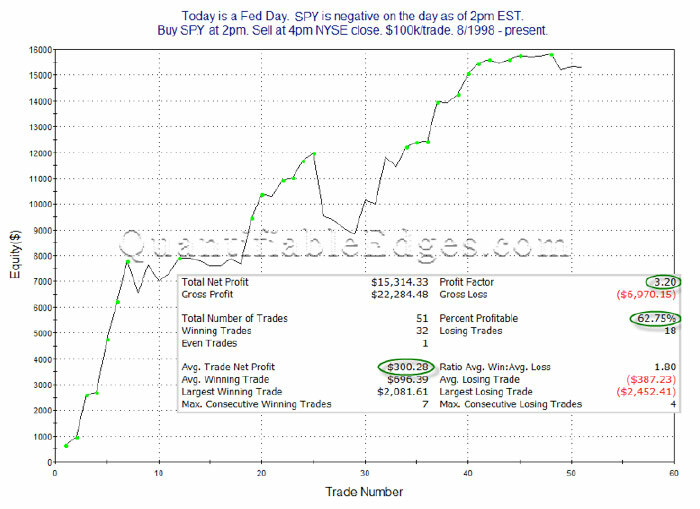 As you will see, the results of such trades over time show some distinct tendencies. 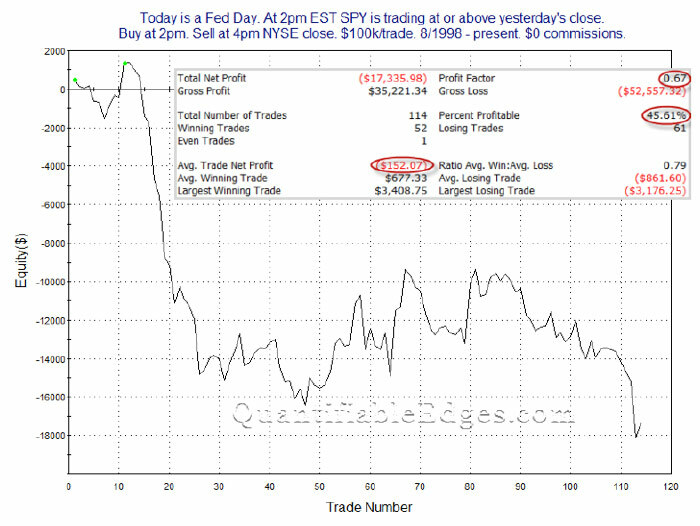 Note: “Trade Number” refers to the cumulative results over time of multiple trades using the outlined trade parameters. 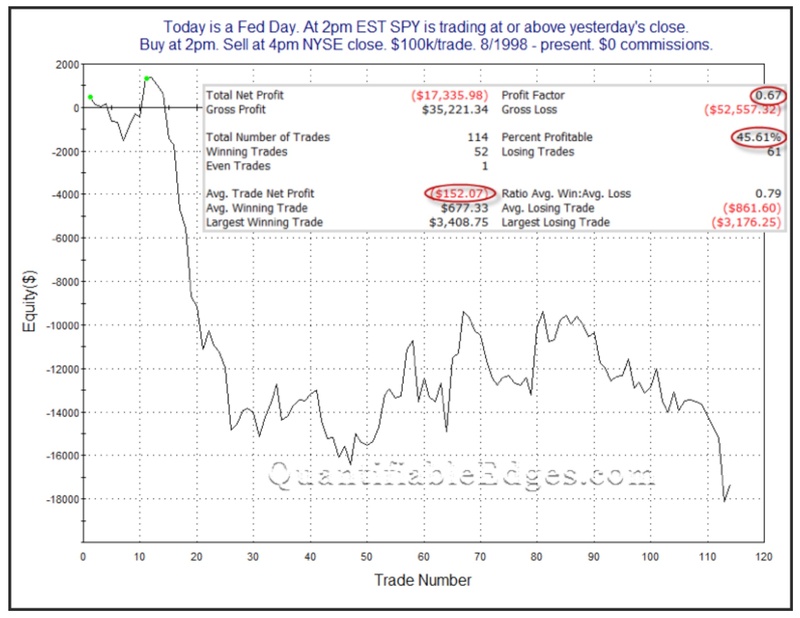 The bullish trading edge has been realized prior to the actual Fed announcement. After the announcement, returns have been very inconsistent. See Related Article: What is the market impact of changes in the Fed’s SOMA holdings? If we break down the post-announcement returns a little further, it is possible to see some interesting tendencies. 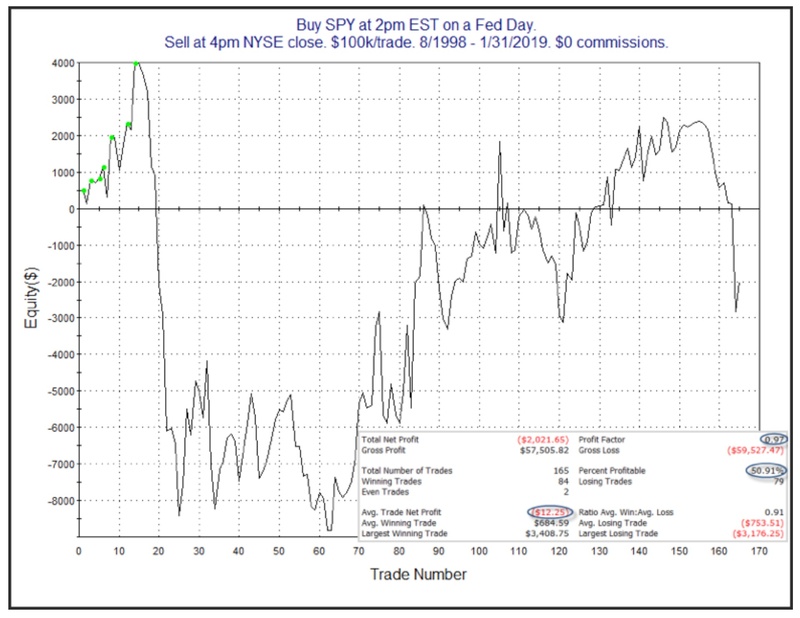 The following two studies examine the SPY’s performance on a Fed Day from 2 p.m. to 4 p.m. based on whether SPY was up or down as of 2 p.m.
First, let’s look at days in which the market was showing gains heading into the late afternoon. It appears that pre-announcement optimism heading into the formal decision has more often been punished than rewarded (Figure 3). Over time, this would have generated a substantial net loss. What about times when the market has seen selling heading into the announcement? 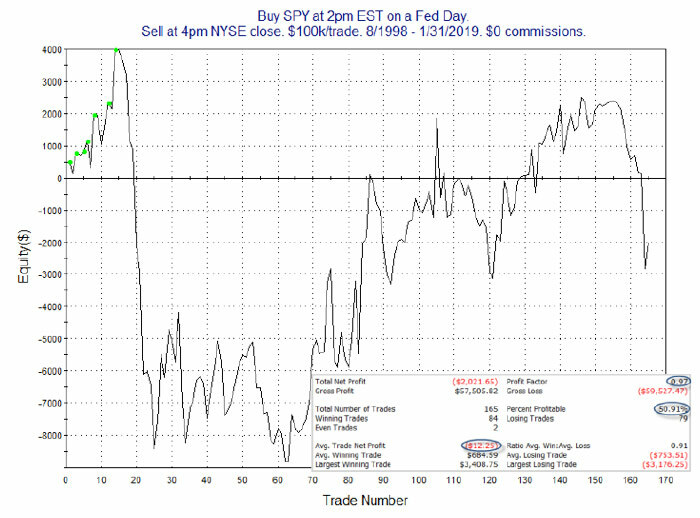 Based on these results (Figure 4) it appears that some fear heading into the announcement has typically led to an afternoon relief rally. In any case, there has certainly been a stark difference in post-Fed-announcement returns when looking at a market that is rising on the day heading into the announcement versus one that is falling. Of course, studies like these take a very narrow view of market behavior. Whether the market moves up or down after a Fed announcement depends on more than just what time it is and whether the market is up or down on the day at that point. 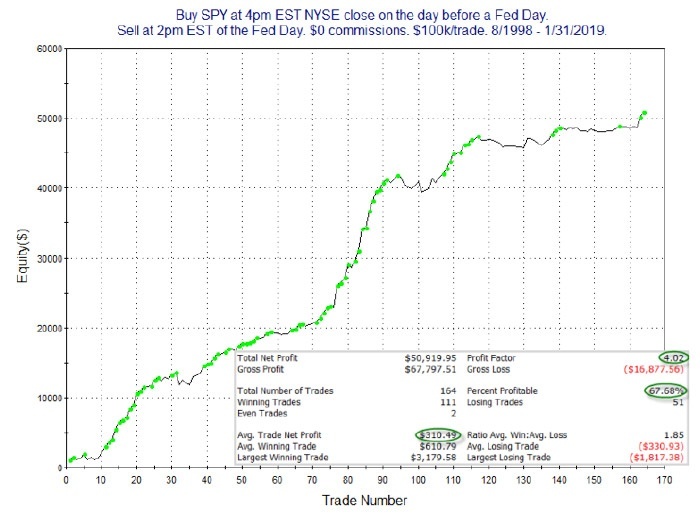 But by understanding small edges like these, traders can put the odds in their favor when establishing their trading bias and look to better time their entries and exits.